Google+ is Google’s Social Network, or at least, that is what we all think it is. It is Google’s effort to push out Facebook and to be the biggest not just in search, but also in social. But in fact Google+ is not intended to be that Facebook killer. Yes, off course, if Google gets the chance, they will definitely try to beat Facebook. But Google+ in fact is more about data: it will be part of every Google product in the future. If you listen carefully to what Googlers are saying you will get some nice insights into what the intentions from Google are. They are going to change the online world with Google Plus and the crux is data, identification, personalization and integration. 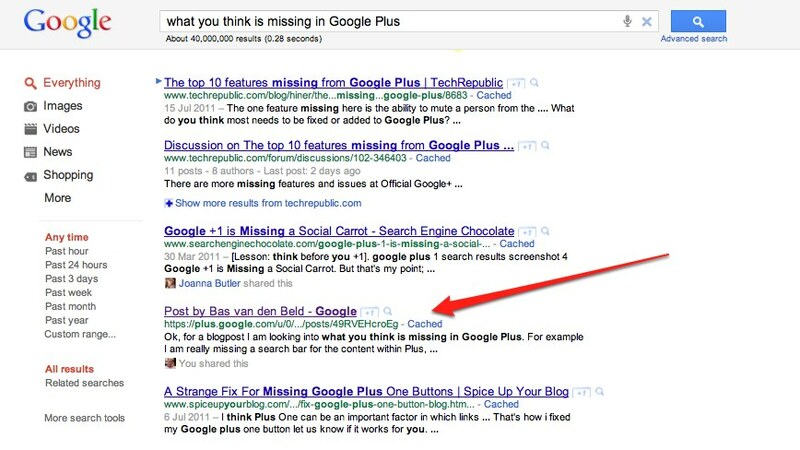 Note: this post has been edited since it first was published in July 2011, just after the launch of Google+. The essence of the post is still the same, but information which enriches the post has been added. It wasn’t even ready, why launch? Google is going places with this project. And that is why they are taking this project one step at a time. We have seen many signals in the last year or so of Google heading in this direction. They have been dropping ‘social layers’ on us. The ‘pimping’ of the Google Profiles was an apparently small but very important step but also the “shared by” options you see below search results are an indication of where things are heading. The launch of Google+ was a next step, and this time it was a huge one. But also one which couldn’t be postponed anymore. When you’ve read Stephen Levy’s article on Wired you will know that Google has been working on this project for a while now. There had been many Googlers testing this. That is nice, but at some point you’ll need to test on a bigger audience. And that time had come. To really test Google needed the ‘real users’ and not just the Googlers, so they opened Google+ for the public. Other features which were launched in the first 14 months of Google+ were the possibility to ignore people, Google finally added search to Google+ and introduced hangouts, suggested users within the Knoweledge Graph area and the biggest change came when Google introduced Google+ for Businesses, Search Plus Your World and the connection with Google Places in Google+ Local. 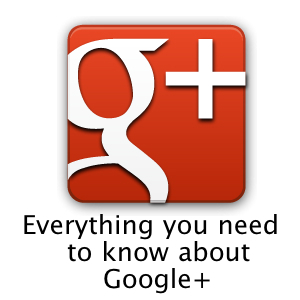 So what is Google+ Really about? We are already seeing a lot of integration of Google Products and different social elements into the Google+ structure. But we can expect a lot more. Look at the different Google products and services, figure out how they could be social and connected and you will be a step closer to understanding where Google is going. Important is to look at the bigger picture: Google will be making everything social and connected. It is a whole new way of looking at the web, looking at search and looking at social. Larry Page wasn’t kidding when he connected the Google bonuses to the Social Success of Google… The closing of specific products throughout the year shows that Google’s focus is fully on Google+. I really want to like Google+, but so far it has failed to impress me. For example, the ‘Sports Cars’ Sparks is littered with spam links such as http:// www. thetruthaboutinsurance . com/what-do-insurance-companies-consider-a-sports-car/ (I have deliberately added some spaces in the url). But since it is probably Google search that is providing these links, these results where to be expected. You are right if they were broken, they are not, they just don’t work yet. That is what Schmidt was hinting at when he said “you won’t see much now because that technology is being improved right now.”. They will be rolling that out, we have to keep in mind this is not the full product yet. That is a totally different post there, might have to write that too :). I don’t think SEO is dead or anything, but it will fundamentally change. Nice article. I think with this project, Google creates endless opportunities for themselves. The integration with all the Google based programmes will be, (at least I hope) great. All of the above is part of a roadmap with products informing products contributing additional dimensions to data that have not been possible before. Totally agree, I think we are on one line here. Google+ is not about the network per se, it is about the data. I do think that it is about more than search too btw. Agreed, but surely Google realizes that this initial data is skewed and will be skewed until they get a significant user base. This ‘data’ would seem to be mostly useless at this point — since it’s primarily the early adopters — i.e. marketers talking to marketers. So at what point does this data become valuable? They will off course realize that. But you have to start somewhere and with estimates of 10 million people already there they are getting that data fast. And don’t be fooled, the data is not gathered just on Google+, it is gathered around all Google products. Your searches, your Gmail, your maps-behavior, you don’t have to be on Google+ to hand Google data. Do people really need want another social network? While some points of the article are interesting, in my opinion Google+ doesn’t offer anything significant enough for average users to make the change from Facebook, where ALL their friends are. Sure marketers will jump on the bandwagon like they always do, but this isn’t a game changer like some are saying. Google is however utilizing social media better than they have in the past promoting their new project. Looking at the responses people don’t mind another social network… It doesn’t have to mean they switch networks. They can maintain both. And again, +1 is everywhere, that is the essence of this post also. You cannot miss it, when you are doing a search, its there, when you are in Gmail, its there, etcetera. And imagine you doing a search and seeing one of your friends has recommended it, the chance that you click that link has just become much bigger. A fascinating read and very thought provoking – I now find myself reflecting on what other clues are out there that might reflect Google’s ‘big picture’. 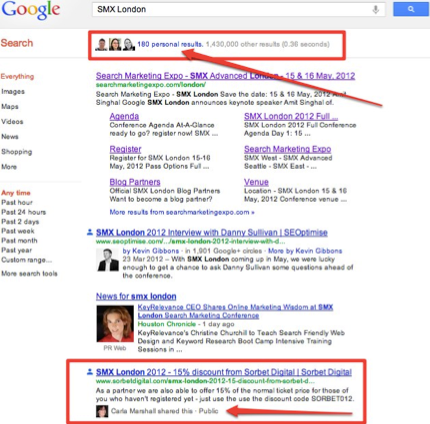 For example, Google’s Webmaster Central Blog has very recently been posting a lot on Google + (understandably) but also on authorship markup and on their support for schema.org (they’re not alone amongst search providers in that support, of course, but maybe they’ve been at the helm?). That all seems to fit? 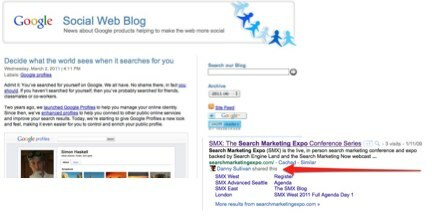 I’m also going to re-read Google’s announcement yesterday of the new product search feed specs and policies (http://googlemerchantblog.blogspot.com/2011/07/important-changes-to-google-product.html) – maybe the new requirements (to be obligatory from September 2011) will hint at opportunities for social integration? Certainly they state that they are “confident that the new feed specifications will have a strong impact on the user experience”. OK, maybe we could now go too far speculating about every piece of information they put out there, but it’s going to be fun doing some detective work. Certainly the pace of change at Google seems to have accelerated, which of course is exactly what was anticipated with Larry Page moving into the role of CEO. A fascinating time to work in Internet marketing! P.S. Everyone is talking about G+ as it compares to Facebook. Having explored G+ (as an interface I rate it over FB, BTW), I think the competitive opportunities are much broader. If I were LinkedIn I’d be very nervous right now. I´m really starting to wonder how any other search engine in the future can even have the slightest chance to compete against Google, if the personalized search model they are developing, actually is working well (I can´t see why it shouldn´t). But, will good resources be “buried” in search for something, just because you have friends with different interests than you? I can’t wait to see what happens with Google+ as it develops. The current version of it already has me migrating contacts from Facebook and Twitter, and I only suspect it will pull more into it as time goes on. You have it all wrong. We were getting close — *THIS* close — to figuring out Panda, so Google threw a new toy to the SEO industry and squirreled us. Very well thought out article, which mirrors my own opinion about Google + almost by word. Integration is the key. It is not in a Beta stage, it is in developmental stage and will keep changing as it grows and evolves over a period of time. In time being a part of this project may cease to be a matter of choice and become a matter of necessity and later inevitability, as it evolves into artificial neural network, the first of kind on such a grand scale. Google+ have add-on features like Business profiles that will definitely help the public to update their profiles.This new update is in a testing phase which will be be activated soon.Looking forward for Google’s new venture. Everything with Google is about…DATA….everything! It is part of the all seeing eye of kucifer to traxk us so that we may be call terrorist or not. Just a way to track peopke more closely its part of that all seeing eye. you are so spot on! it has no real purpose except gathering data on you. That is why this article and most others about google + are confusing so many people because it does very little for anyone using it and therefore no one can define what it actually does and if they did less people wouls use it. Sadly a lot of people today are like sheep and have this “must have” attitude towards phones and social networks, they think if they are not on facebook or twitter or dont have the latatst i brick then they are not cool or up to date. It’s a pity more of us just weren’t our own people! I hate not being able to eg review a game on google play without registering with google+. I won’t be joining, just like I left facebook a few years ago. Over it. Far too much intrusion. I mean, look what google is doing with youtube – making a right mess out of layout, etc. The personalisation is gone. They want to personalise data? Well then, stop messing about with US and exerting control where we have to have something to do with YOU google before we can be ourselves online. Google+ is going to be used at a large scale. It has multiple features that easily connect people, branding product, community circle and what not. I think Google+ IS THE COMPLETE SOCIAL MEDIA. Google+ is a completely different beast. Social signals are becoming more and more important and surprise surprise Google favours those that come from their own SM platform. Join communities, share relevant and interesting content (and if you’re lucky enough to get a comment) start a conversation. Then all you have to do is sit back and watch the +1’s role in. What about being safe on Google+ ? Privacy. everything that is supose to be free downloaded then google takes you to google+ and then must log in to purchase the suppose to be free software WHY?